The cap molds provided by Demark is designed with 3D computer drawing, so the product yield rate is enhanced. It also designed with advanced second-level trapper positioning technology and slide-type independent self-locking. In this way, the concentricity of the product is guaranteed. Since the cap molds are made of high grade steel from Japan, we can assure you the quality of this product. You can purchase the molds along with the bottle molding machine for your plastic injection molding business. 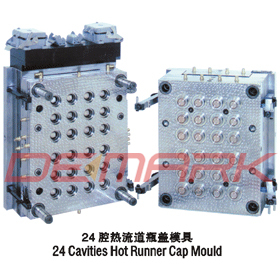 This DMK-CAP24 mold adopts advanced and reasonable design, and each cavity has independent temperature control and heating system. The system boasts an even heating temperature while production and keeps product with reliable as well as stable quality. 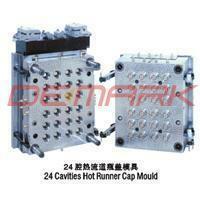 The cap molds also have independent condensation system in each mold cavity and mould core. One of the special features of our mould is that the mold cavity is replaceable, so the label atop can be changed. We Demark provides not only quality molding equipment but also professional after sale service. We provide both domestic and international services, and the customer service call is 24-hour on called, so you can find the solution anytime if your machine has problems. For domestic call, we will provide service within 12 hours while international call within 24 hours. If you are interested in our cap molds and services, please do not hesitate and contact us for more information!